Summer 2018 is almost gone. And it has been a Summer full of meetings, boats and tweets. I would like to sum up the most important of them. On the 25th of June the European Parliament Libe committee (Civil Liberties, Justice and Home Affairs) voted a draft proposal in order to present, during the Strasbourg plenary in September, a resolution to trigger the Article 7 of the Lisbon Treaty, that could, after other intermediate steps, denies the right of Hungary to vote in the European Council. One of the key concerns is the situation of migrants and refugees. At the beginning of July, three MEPs (Member of the European Parliament) of the Gue/Ngl, Eleonora Forenza, Miguel Urban Crespo and Joao Pimenta Lopes boarded on the “Astral” ship of the NGO “Activa Open Amrs” to show how much is important and vital the work of many volunteers across the Mediterranean Sea and to launch a message to the European Council to take into account the proposals that the European Parliament have made to change Dublin rules and to criticize the way the European institutions are facing the migration issue. One month later, on the 11th of August, Angela Merkel resumed informal bilateral meetings, this time with the Spanish Prime Minister Mariano Rajoy Brey. They agreed on many points, especially on the necessity to reform the Dublin agreement and to help more Tunisia and Morocco. The Spanish enclave Ceuta border is an issue that affects Spain directly and deeply. But migration is not just a matter of institutional meetings. 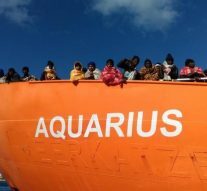 This summer, the NGO “SOS Mediterraneé” boat “Acquarius” sailed towards Spain, but only after been trapped between Malta and Italy with more than six hundred rescued people on board. Few days after, another boat, the Italian Coast Guard Off-shore Patrol Vessel “Diciotti” with more than one hundred and seventy persons on board, was forced to wait ten days before the new Italian Interior Minister, Matteo Salvini, gave the authorization to dock. It has been a real controversial issue. Many Italian authorities, both national and local, came to Catania’s port and some of them visited the migrants on the ship. Among them, there was an Italian MEP from S&D, Socialists and Democrats, Michela Giuffrida. Last but not least, and it can explain how much this incident is still considered controversial, one week later, Matteo Salvini has been investigated by Agrigento’s Public Prosecutor, Luigi Patronaccio, for five offenses; one of them consisting in the suspect that Salvini has used the “Diciotti” to force the EU institutions to negotiate the migrants’ relocation. Currently, the trial is still going on. Moreover, the 10th of September the new high commissioner for Refugees at the United Nations, Michelle Bachelet, has strongly criticized the Italian Government for the climate of intolerance and the numerous assaults against black and rom people in Italy, saying that she wants to send, not only in Italy but also in Austria, some UN agents to verify the situation. Immediately, the Italian Foreign Minister, Enzo Moavero Milanesi, has replied saying that the alarm was unfounded and unjustified. Salvini’s reply was a bit less diplomatic, he threatened that Italy will not give anymore its one hundred million Euros as annual contribute to the United Nations. Furthermore, during the last plenary session of the European Parliament, between Monday 10th and Thursday 13th of September, there was a vote on the LIBE committee proposal about the problem of the rule of law in Hungary. On Tuesday the 11th, the day before the vote, Hungary PM Viktor Orbán claimed in the European Parliament that the “verdict was already written”. Written or not, the Parliament voted in favor of the resolution (with 448 votes), launching a very strong admonishment to Orbán’s Government. During the same week, in Strasbourg, the President of the European Commission, Jean Claude Juncker, have made his annual speech on the state of the Union saying that “Europe must remain a tolerant open continent. Europe will never become a fortress turning its back on the world, notably the part of the world which is suffering” but he also affirmed that “we are proposing to accelerate the return of irregular migrants. The Commission is committed to supporting Member States in doing so”. Moreover, he added: “The Commission is today proposing to further strengthen the European Border and Coast Guard to better protect our external borders with an additional 10,000 European border guards by 2020”, not exactly a linear idea of the word ‘welcome’. On Friday 14th in Vienna there was a meeting of the Interior Minister of the Union on “Security and Miration” where they try, but they didn’t manage to reach an agreement on the issue. In this occasion, Matteo Salvini and his Luxembourgian counterpart Jean Asseldbord had a “frank exchange of points of views”. Stephan Mayer, that was replacing the German Interior Minister, tried to achieve a bilateral agreement with Salvini. But if, Seehofer declared to the Bundestag that the agreement was reached, (even if there are just some technical matters to fix), Salvini didn’t. Who is lying? The spokesman for the Interior Minister of Berlin also declared: ”The political agreement between Rome and Berlin on the rejection of migrants provides for an adjustment mechanism, so that for every rejected migrant, Germany undertakes to welcome a migrant rescued from the sea. It’s a zero-sum game but it’s still an important agreement and not to be underestimated because it concerns the control of secondary migration”. It is a step forward? Anyway the milestone cannot be a bilateral agreement, all the stake is on the future of Dublin rules. When will all the players, European Institutions and national Governments, stop to postpone it? The answer and the further results will determine the future of the European Union.